Is the mirror box portable? Yes the box collapses down to the size of an A4 sheet and is about 1 cm thick when collapsed. Does the box require a separate power source? 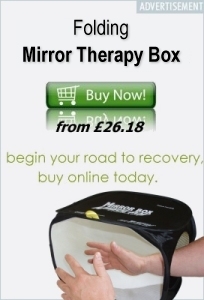 Can I do myself harm using mirror box therapy? Mirror therapy is not a placebo effect as it reconditions and retrains the brain to normalise its function. It is important to understand that asymmetrical movement, keeping one limb intentionally still whilst moving the other and simultaneously looking in the mirror at the virtual image may worsen the condition. How often should I use the mirror box? The short answer is as frequently as is comfortable. 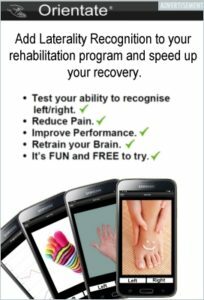 All rehabilitation exercises should be undertaken in a paced and goal oriented fashion. That is to say that they should be repeated regularly and built up from a low base. They should be undertaken at a frequency and intensity, which allows for similar activity the following day. What if my therapist has never heard of mirror therapy? Direct them to the www.mirrorboxtherapy.com and suggest they contact us if they have any questions or reservations about the therapy.